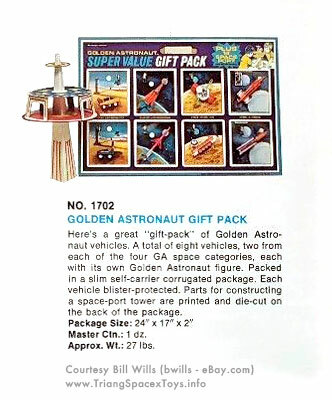 This Gift Pack is illustrated in the 1971 dealers' catalogue from Multiple Toymakers. It contains 8 toys from the first series, 2 each per 'category' theme: Terrain Tiger and Lift Loader (Tractor and Forklift), Hawk and Needle Probe, Explorer (Prospector) and Mobile HQ, Command Ship (Space Patrol) and Nova Rocket. 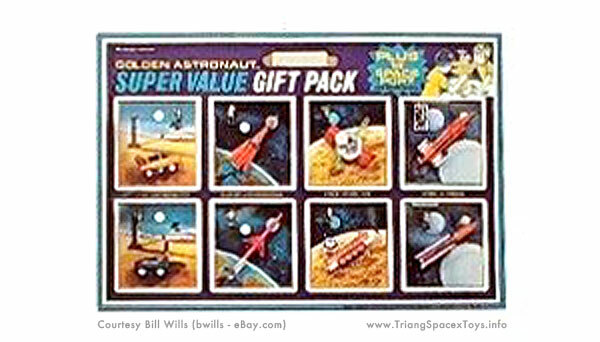 Each of these comes with an astronaut figure, sitting in its own blister on a corrugated backing card. According to the catalogue text, the package measures 24 x 17 x 2 in / 61 x 43 x 5 cm. The rear of the backing card contains a kit to build a spaceport tower (shown below), the parts being pre-cut for convenience. (As a note, I am hoping for better quality scans to replace the blown-up picture above).